Some of you reading this have a dream in your heart, but you’re not seeing your dream happen. Instead, you’re going through the valley of the shadow of proverbial death, and you don’t understand what God is doing in your life. If that’s you, I have an encouraging word for you today. First, let me be clear that most things we call suffering do NOT originate from God. Sickness, abuse, and poverty are NOT from God. He doesn’t have sickness and He doesn’t give it. He never abuses; He is a kind, loving Father. And all of the heavens and earth belong to Him, and He has promised to provide our every need. Sickness, abuse, and poverty are the effects of sin in this world. They are not from God; they are not His will, and we should never act like they are. God is your Healer, your Deliverer, and your Provider. If you’re going through any situations that require healing, deliverance, or provision, you should press into God and seek His help. Never accept the effects of sin as your lot in life. Never. But I want to talk to you about a different kind of valley you might be going through … a valley in which God is asking YOU to die. Maybe you’ve just been laid off from your job through no fault of your own. You don’t understand why, but you know God is asking you to trust His plan. Maybe God is speaking to you about laying specific sins at Jesus’ feet (pride, lust, control, manipulation, envy, etc) and walking in holiness instead, and you’re struggling to obey. Maybe something else has happened in your life through no fault of your own. You’re feeling blue about it, but you know God is asking you to let it go. Then Jesus said to His disciples, “If anyone desires to come after Me, let him deny himself, and take up his cross, and follow Me. For whoever desires to save his life will lose it, but whoever loses his life for My sake will find it” (Matthew 16:24-25). Even though we’re already dead to ourselves and alive in Christ, we still have to decide to act like it in our daily lives–to refuse our flesh and let the life of Christ flow through us by the Holy Spirit. I’ve been going through a death-to-self season like this. God has been asking me to lay down some things that have been important to me. He’s been asking me to let go and trust Him; not to fight or try to defend myself; but just to relax. And, proverbially speaking, to die. It’s been tough. But you know what? I’m hungry for my dreams. And when this started, even though I didn’t like it, I could smell God at work. In the past, I’ve tried to resist the death process at various times, and resistance has never had good results. So this time, I decided to jump in with both feet. I determined I’d be the most humble thing on earth (like Moses, who himself wrote that he was the most humble man alive, hahaha) 🙂 and just embrace this death process. God has honored me for it. It’s only been a few weeks, but I’m already seeing the harvest start to come in. And the harvest will be bigger and better than my little grain of wheat ever could have been. He’s only asking you this because He wants to promote you. God knows every desire of your heart. He knows your dream; He gave you your dream. And He’s ready to promote you to the next step toward it. Did you get that? “Unless a grain of wheat falls to the ground AND DIES, it remains alone.” In God’s Kingdom, promotion requires death first. But if you obey and let yourself die, like that little grain of wheat, you get a huge harvest. 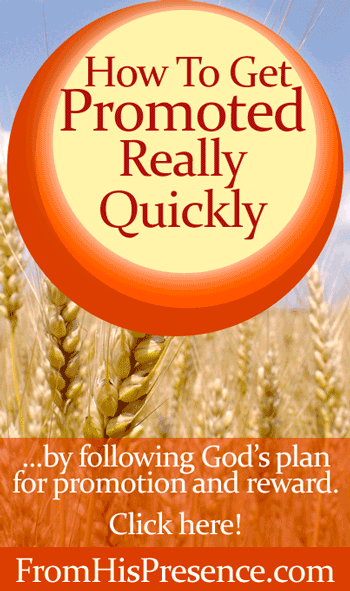 This is the key to promotion in God’s kingdom. This is the key to your dream. God uses the storms we go through to launch us into our destiny. He uses the giants we encounter to promote us to the next level of kingship. It’s His way. Think about David in the Bible. Why did David happen to encounter the giant on a battlefield one day? Was it chance or happenstance? No way! David encountered Goliath that day because it was God’s day to promote David to the next level, and God wanted him to kill that giant so He could be promoted. He had to die to fear. He had to allow himself to be mocked. He took a risk and laid his life on the line to defend the cause of Israel. But when David died to self like that, God honored him and promoted him to the next level. David became one of the most famous men in Israel. He became the son-in-law of the king and a mighty captain of the army. Eventually, he was crowned king himself, and remains the most famous king of Israel to this day. It’s almost like that death-to-self thing worked out pretty well for David. Well, what about you? How does this apply to your life? Right now, God is asking you to die to some things. Why does He want you to do this? Because He’s ready to promote you too. God is asking something of you. He’s asking you to manifest your death-to-self-and-life-in-Christ in a particular sin, habit, or situation. I know it might feel painful to let go of this thing. It might go against the grain not to try to defend yourself. But you CAN do it, because He never asks you to do something He won’t give you strength to do. You will reap a harvest, and God will honor you. When you recognize that God is asking you to surrender and manifest your death-to-self in your situation, hurry up and submit to His instructions. There’s no getting around it. God is up to something in your life. Even though it looks hard, an amazing harvest is just around the corner. There’s victory on the other side. So don’t delay. Just embrace the process, knowing that glory and new life and harvest are on the other side of this death. And when you do, God will use your surrender and obedience as a catapault to launch you to the next level of your destiny. Does this message resonate with you today, in terms of whatever YOU are going through? If so, please leave a comment below. I’d love to hear from you. Image courtesy of Tim VanReenen on Flickr via Creative Commons license. Image has been cropped and graphics added. I really thank you for lending yourself to God so that He uses you to assist others in growing in Him and experiencing the fullness of God and his resurrection power. I am on my Day 12 and I can see God moving. I wanted to comment before, but my heart was hurting and I did not want to post my pain. I wanted to post something encouraging. Previously, I was still waiting as you instructed to hear God. I was upset because I am currently in a situation, where I need to hear God’s voice immediately. It appeared as though my enemies had beaten me up and that I was waiting for God to manifest Himself and save me. I became angry and kept asking God to please step in. I kept reading your posts believing that I will eventually hear from God because I know that Him will never leave me nor forsake me. I had worked very hard for a very long time on a school situation accomplishment and it appeared as if it was taken from me. Lots of money spent, and I was inches, I mean inches from the end and I felt that it was taken from me. I told myself that I would continue to read your posts and then, this morning at about 3 am, I had a dream of the Lord speaking to me. I woke up with so much peace, direction and joy that I knew it was Him. I wrote the dream down in my secret place of prayer. I then read your posts which was written at 3am. It spoke exactly what I was going through. It was your post on getting promoted but having to go through a valley experience where I have to die to self in some way. Each word I read, jumped off the page and resonated in my heart that God is speaking to me through your valley experience so that I could relate and understand what was going on in my life. The words also were some of the same words that my Pastor spoke on yesterday, May 17, 2015 in his sermon. I kept feeling joy, peace and a sense of direction as I read the words. I am so excited that I am learning to hear Him more and truly thank you for lending yourself as a vessel so that I could be assisted in practical steps in learning how to hear Him and abide in His presence!!! Kahn, that is absolutely incredible. I am so amazed. God is so GOOD!!! I worship Him with you. Thank you for sharing your story. I will pray for you. And one encouraging word I wanted to reiterate for you today: The size of the giant you face is a clue to the size of your destiny. Hang in there. GOD’s got this. Keep pressing into that secret place in God, and He will work it out. Thank you for reading my blog, and thank you for sharing!!! Again at the right time. I’m still dealing with my legal situation and it brings so much pain, sadness, anger and rage because I can’t do nothing at the moment. My future is in the hands of others right now and I can’t bear it. But I think you’re right. I have to let it go (in french we say “Lâcher prise”) and wait that the storm calms up and see what God has in store for me. I know by instinct that if I interfere myself things go bad. But, it’s so difficult to stay quiet not defend ourselves and not be able to clean our reputation and do justice to a situation. But I have to die to that situation while God is working. Thanks Jamie for the right words at the right time. You’re a messenger of God, truly. Hi Rafael-Olivier. I am sorry you are still in the middle of your storm, but you are right. Papa knows all about it and He has SUCH good plans for you. He has plans to prosper you and not to harm you. If you will submit to His Word and follow Jesus as you walk through this, it will turn out better than you ever dreamed in the long run. He will take care of you. He loves you very much, and you are His beloved son. Again, sister Jamie, our Father has used you to minister to me. I’ve been in the process of dying to self for several years now, and, I feel, especially since the last 18 months. Even more so in the last month. Yesterday, I was “released” from a volunteer position at my church, and although I’m disappointed, and, if I get “in the flesh”, a little angry, I feel a sense of peace. God has even given me the grace to put into His hands the two people who orchestrated my removal. I’m learning not to defend myself, but to trust God with all of this. I know the truth will come out some day. In the mean time, I am listening closely to hear what Abba would have me do now. Thanks again. I would appreciate your prayers. I’m in a legal battle right now and like you “I know the truth will come out some day”. I keep quiet and I know that the Lord will work things out so I PREVAIL. Yes. Jesus won the victory at the cross–every victory, including yours, brother. Hang in there, hang in there, hang in there! 🙂 And thank you, as always, for reading.